Now that I’m extruding my own filament, I’ve quickly run out of spools to wind the filament onto. Even though I’ve been saving old filament spools. 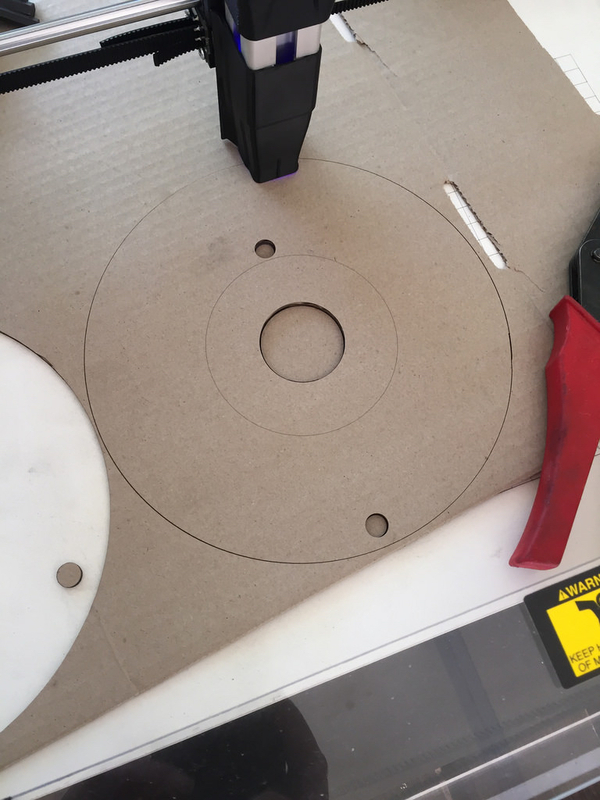 See how I designed my cardboard filament spool. 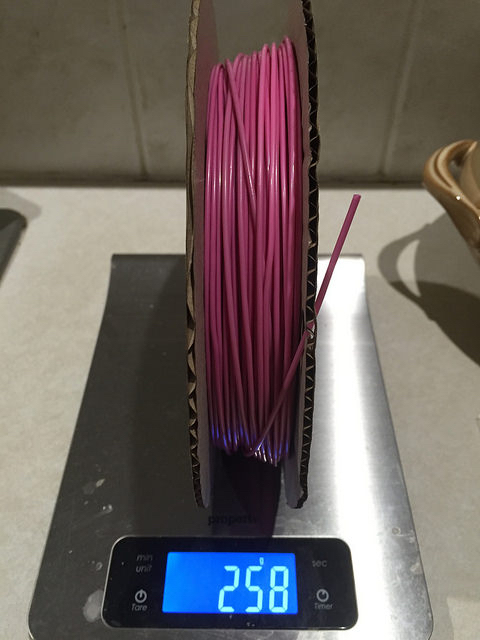 All the filament purchased in the past have been on 1Kg spools, pretty well the standard across the industry I think. Now that I’m extruding my own, I’m no longer limited to 1KG. I can now weigh out my raw pellets in any batch size I want, add the correct colour master-batch ratio and extrude away. I’m finding that small runs of 250g is a good size, so I need a spool to make life easier for storage and for feeding into my printer rather than loose filament. 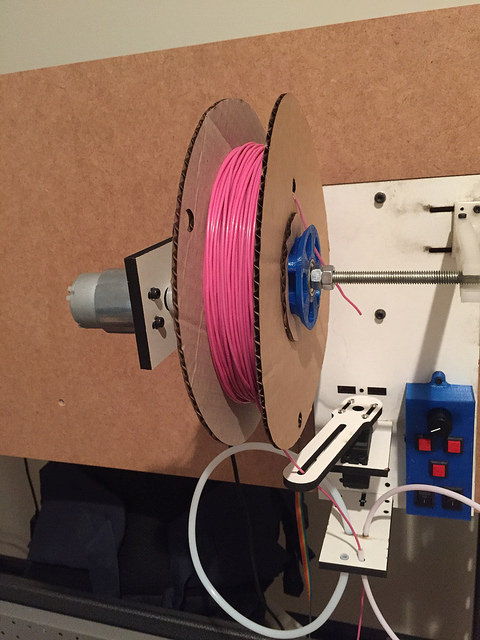 This spool design can be easily made at home with materials on hand, cardboard and hot glue, as it offers a very cheap solution. I wanted spools of varying size, in increments of 250g, so 250g, 500g, 750g and 1KG. The spool must work on the Filawinder and my printer. Unfortunately there’s not a standard out there for this industry, Richard Horn of RichRap blog nicely outlines the problem here. I mentioned earlier that the design needs to be simple, so why not cardboard? almost everyone has access to this. There is the problem that its not as robust as the standard injection moulded spools. Not really a problem in my mind, if I get a few uses out of them. Its done the job as I can always make up some more. After a bit of googling on how to calculate spools sizes, came across this great online calulator for Drum Capacity Estimation. So I’ve used this calculator for all for all my calculations. Please note that calculations are for PLA and ABS for 1.75mm filament, not for 3mm filament. I’ve allowed additional headroom, as the picture below shows the result of 250g of filament extruded onto one of the spool designs, where I’ve tared the scale before-hand. You get an idea of the amount of headroom available. 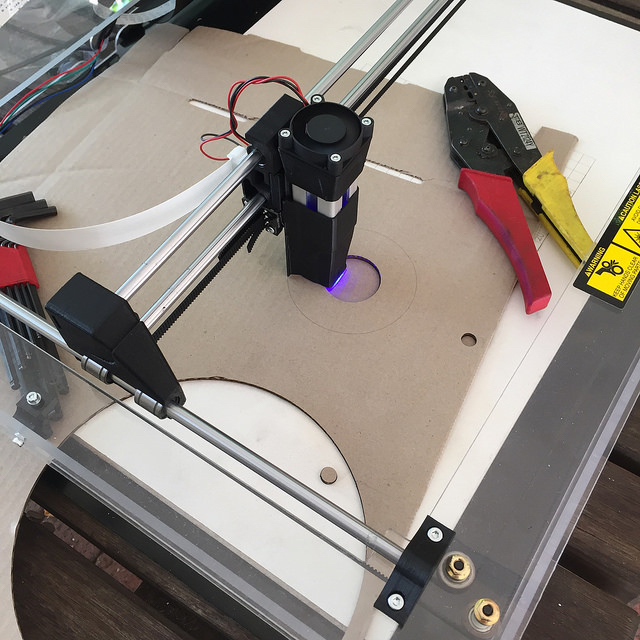 I used a laser diode engraver (embazer) to cut the cardboard but can be easily handcut or use a proper laser cutter to save time and give you the accuracy. The centre line of the side pieces should be an engrave only. 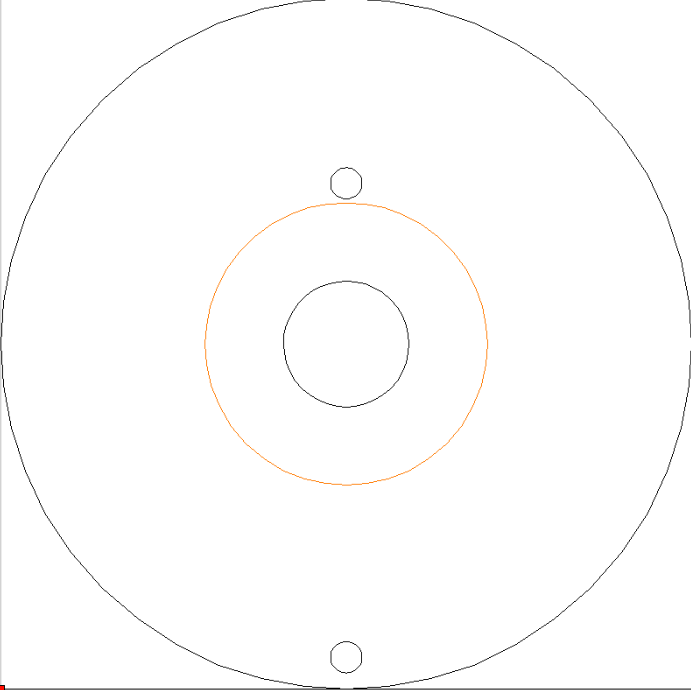 This is used as an alignment locator mark to aid gluing during assembly. You need to cut two ends and I highly recommend to cut two of the re-enforcing rings for each end. This will give each end a bit of addition strength when the spool is placed on the filawinder. You will notice on the DXF files that I have a middle line marked out, this is used as a marker for assembly so you can get things pretty cental when hot gluing. 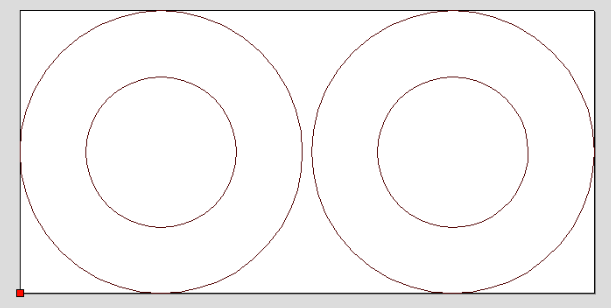 If youre usign a laster cutter, cut this line with a low power ‘engrave’ setting to just mark it. 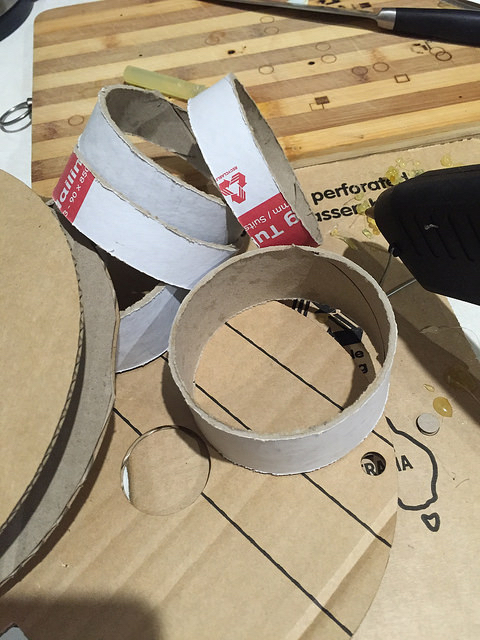 To cut the Cardboard postal tube I used a compass set to the right length to mark around the diameter of the tube then used a hacksaw to cut around a bit at a time, dont just cut thorugh as it will tend to unravel/collapse. Once all the pieces have been cut, use a hot glue gun and apply liberally to one end of the the postal tube length and join to one of the end pieces, aligning with the marked centre (if you cut using a laser cutter), do the same with the other end, but can be a bit tricky seeing the mark but I found using my fingers inside the end hole allowed me to align nicely. In the photo above you can see the end re-enforcing pieces so add them on as well, these are easy to align as the holes are the same as the spool ends. Don’t put them in the oven to dry filament like I did!